We would be pleased to have you visit! 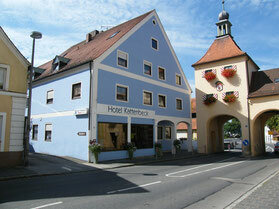 from our modern Hotel immediately behind the Allersberger Towergate. Whether you are a businessman searching for a good and affordable hotel for the fair, as a motorcyclist/biker for an attractive location for bike tours to the near by Altmuehltal or are looking for a family-friendly hotel for an overnight stay during the holidays, we would like to welcome you very warmly. You can use Internet via WLAN by a free HotSpot from Deutsche Telekom.